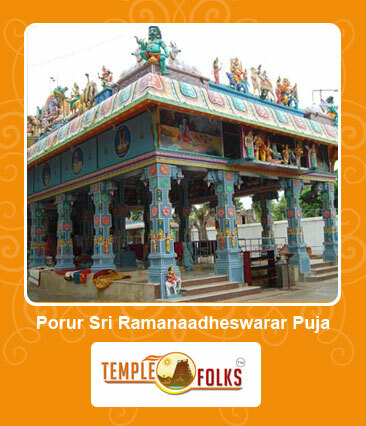 This ancient temple for Sri Ramanaadheswarar is located in Porur, very near to Porur junction, off. Kunrathur Road. This ancient temple is connected to the Ramayana period. According to the history, Sri Rama on His way to Sri Lanka rested here in this place which was then a forest. While resting under an Amla tree (?Nelli? in Thamizh), He realized that there was a Shiva Lingam under the ground and his feet had touched the head of the Lingam unknowingly. Ramanadheswara temple is situated at porur chennai. It is famous for Guru (one of the navagraha temples).The Ramanadheswara temple is the located very near to the porur Kunrathur Junction. For guru dosha Regaspathi Homam will be performed. By Worshipping guru bhagawan removes the malefic effects. Guru Dosha Nivaran Puja and should donate bananas, yellow clothes, salt, sugar, turmeric, kesar, yellow flowers and food to Brahmins. Ardhajamam 10 PM to 9.30 PM.